I am very happy to announce the endorsement of my friend and NC House District 100 Representative, John Autry. It truly has been a pleasure working with John. John currently serves as the representative for the NC House District 100. He also served on the Charlotte City Council representing District 5. We shared concerns for East Charlotte when we served together on Council and he continues to represent parts of East Charlotte in his role as a state legislator. Even when we didn't agree on an issue, we worked together and learned from each other. John works hard for his district. He is smart, thoughtful, and dedicated to making this community more fair and just for all of its residents. I am honored to have his endorsement. 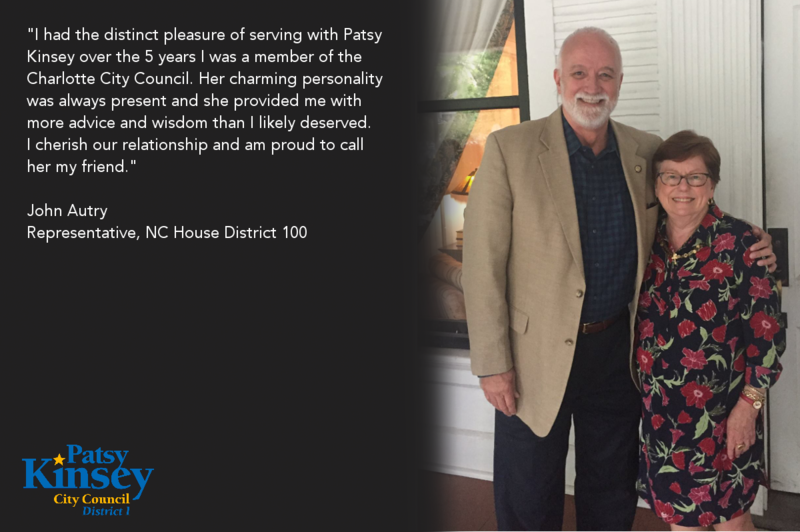 "I had the distinct pleasure of serving with Patsy Kinsey over the 5 years I was a member of the Charlotte City Council. In that time I found Patsy to be a dedicated public servant who went about her duties with grace and a lot of humor. I could always count on her to share a laugh but also she generously shared her experience in municipal government with someone who allowed his eagerness to sometimes get in the way of progress. Her charming personality was always present and she provided me with more advice and wisdom than I likely deserved. I cherish our relationship and am proud to call her my friend."